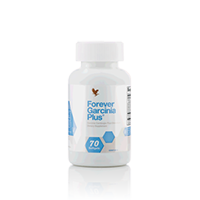 Forever Garcinia Plus® is a revolutionary dietary supplement, containing ingredients that may aid in weight loss. The primary ingredient is a natural substance derived from the fruit of a Southern Asian tree, the Garcinia Cambogia, also known as the Malabar Tamarind. The rind of this fruit is dried and used to produce a substance that is very similar to the citric acid found in oranges and other citrus fruits. Specialists in plant compounds became aware of the remarkable qualities of this substance in the late 1960s, when they learned that it can temporarily inhibit the body’s production of fats from carbohydrates. During the normal metabolism of a meal, carbohydrate calories that are not used immediately for energy or stored as glycogen are converted into fats in the liver. Garcinia works by inhibiting the enzyme (citrate liase) which converts these calories into fat. As a result, the body will burn existing fat stores, thus aiding in weight loss. When enough glycogen has been created and stored in the liver, a message is sent to the brain indicating sufficient food has been taken. This action is called a satiety reflex, and quells the appetite, reducing the desire for more food. The These statements have not been evaluated by the Food and Drug Administration. These products are not intended to diagnose, treat, cure, or prevent any disease.